President Dmitry Medvedev on March 30 criticized Russia's poor business climate and ordered improvements, including a cut in the social tax and the ousting of ministers from corporate boards. "I have already given my opinion on the investment climate in this country — it is very bad. … Corruption remains a factor," Medvedev told a meeting of his modernization commission in the metal-producing city of Magnitogorsk. The rhetoric was not new, but this time Medvedev — who has yet to say whether he will run for his second term as president in the 2012 elections or whether Prime Minister Vladimir Putin will return to the Kremlin — had concrete measures up his sleeve. He ordered that ministers be replaced on corporate boards of directors by independent representatives by mid-year and called for a reversal of a hike in social taxes, which came into force this year, despite much opposition from businesses. "The rate of 34 percent can be unbearable for many sectors," Medvedev said. "I am going to order the government to establish mechanisms that would reduce the rate starting Jan. 1, 2012." The tax initiative will please business but could pose some concerns about Russia's long-term economic stability. The Kremlin's top economic aide, Arkady Dvorkovich, told reporters that reversing the hike in social taxes — which were raised to 34 percent from 26 percent from January — could cost the budget 400 billion to 500 billion rubles ($14 billion to $17.5 billion). Currently, many state-controlled behemoths have top government figures on the boards, including Finance Minister Alexei Kudrin at VTB and Deputy Prime Minister Igor Sechin at Rosneft. The board of gas export monopoly Gazprom has Economy Minister ElviraNabiullina, Energy Minister SergeiShmatko and First Deputy Prime Minister Viktor Zubkov. Medvedev reaffirmed Russia's commitment to privatizing state stakes in key companies, which it kicked off with the sale of 10 percent in VTB earlier this year. He said his other big initiative — the formation of a direct investment fund where the state will co-invest with foreign funds into the Russian economy — would be launched at $2 billion, eventually increasing to $10 billion. The fund must be able to guarantee capital inflow of at least five times the size of the fund itself, Medvedev said, adding that it should be set up by mid-summer. The president also addressed the issue of transparency for minority shareholders. "If the minority shareholders are not provided information, this means one thing: It means that there is something to hide," Medvedev said. The president said "any case of violations of minority shareholder rights could be seen, therefore, as an example of ineffective managerial work"
He added that this oversight work should be carried out by the recently reorganized organs for regulating and overseeing financial markets. 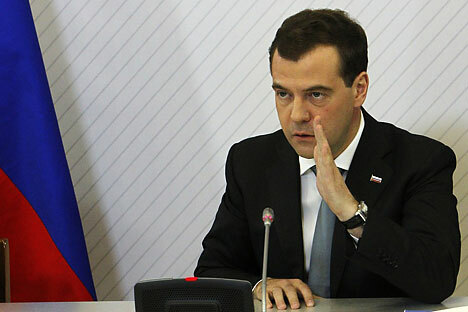 At the same meeting Medvedev said Gazprom, Transneft and Russian Railways should cut material costs 10 percent annually. The president highlighted corruption as being one of the main enemies of economic development and increased investment. "Corruption remains a factor that influences the entire economic situation. Corruption's grip is not weakening, it has the whole economy by the throat," Medvedev said, adding that only an increase in investment would ensure the creation of a new economy and provide people with creative, high-paying jobs. Medvedev granted new powers to the Economic Development Ministry in an effort to improve the country's investment climate. "The ministry will be given the authority to present proposals to the Justice Ministry for removing administrative regulations that, without justification, make it difficult for business and investment operations. The Justice Ministry will also be obliged to require institutions that have adopted anti-business regulations to remove them immediately," Medvedev said. In the same vein the president gave the government until the middle of May to introduce a bill to the State Duma to curtail the powers of the commission for monitoring transactions in strategic sectors. In an apparent nod to the recent reversal of tougher registration rules for foreigners, as well as his promise to reduce the social tax, Medvedev instructed his administration to draft a decree to ensure that regulatory acts are discussed with business associations before they are issued. The president also had a tough talk with Education and Science Minister Andrei Fursenko at the same meeting. Medvedev asked Fursenko how many higher education facilities there are in the country. Fursenko responded that there are between 1,200 and 1,300 state and private institutions. "We understand that half of those could easily be closed down, without any loss to the quality of education [in the country]," Medvedev said. "I can say something like this, while you can't," the president added.